No, it's not a band from 1985. 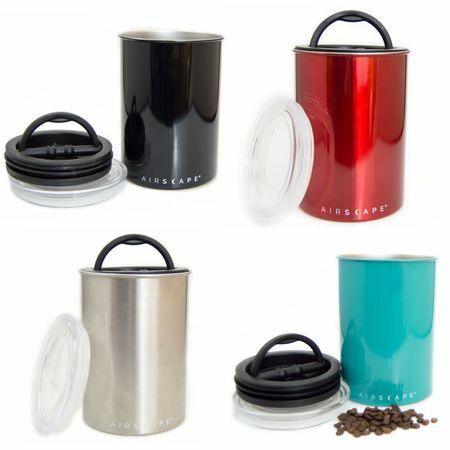 It's a fantastic coffee storage container to keep your beans as fresh as they can be. Light, air, moisture are all coffee's enemies, and this sleek container from Planetary Designs does the job with a clever 2-lid system. The first lid presses excess air out of the chamber and blocks light. The second see-through lid creates an additional barrier, plus lets you see the contents level inside. Super clever, clean, and easy to use. Will keep your freshly roasted coffee at its best flavor right at room temperature (yep, right on your countertop). Lizzy's Tip: Great for whole bean coffee. Ground coffee tends to fly out of the container when the suction lid is removed (uh-em....yet another reason to buy a grinder). Canister restaurant-grade, 18/8 stainless steel with an enamel paint finish. Lids plastic. I purchased this container in black. I really love how it looks, and it does a great job of keeping my Lizzy's beans as fresh as they can be.